The career fair 2019 was held for students of economics majors. Jobs directly related to students of economics majors with a bachelor's degree include marketers, accountant, financial advisor, financial analyst, auditors. In addition to direct interviews at 15 booths of participant companies, students can find out information of companies’ history, job requirements to equip themselves with workplace skills for the future jobs. 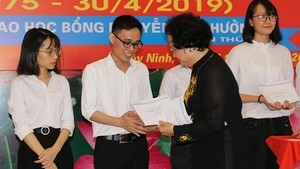 There are 15 companies registered to participate in “HUTECH Economic Career Fair 2019” such as Nam A Bank, CMC SISG, Sacombank, Danh Khoi Real Estate Company, HCMC Securities Company.